For the past four years, one word has dominated my world: divestment. In 2012, I co-founded Divest Harvard, calling on Harvard University to divest its $36.4 billion endowment from fossil fuels. Divest Harvard grew from a group of three people into a movement of over 70,000 within two years. Meanwhile, hundreds of fossil fuel divestment campaigns launched across the world. I learned one enduring lesson with Divest Harvard: in the age of climate chaos true leadership comes from youth. 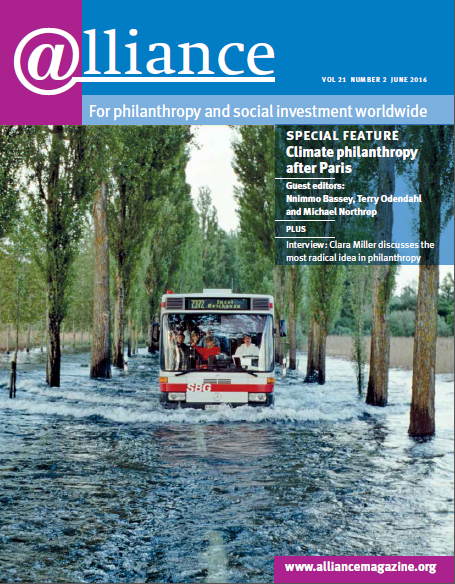 Now I see that philanthropy can play an important role in supporting today’s young leaders. In early 2015, we organized our first campus-wide referendum in which 72 per cent of students supported divestment. This was also the first vote on fossil fuel divestment worldwide. We organized rallies and protests. Six students blockaded the office building of Drew Faust, Harvard’s president. This led to the first campus arrest since the Vietnam War protests and the first arrest of the divestment movement. The Harvard administration refused to act. So on 12 February 2015, 34 students launched a sit-in inside the president’s office building. We occupied the main hallway, hung banners, posted on social media, spoke with press, released statements and prepared for arrest or a long occupation. Drew Faust came to see us. She had publicly said a few months earlier that Harvard is defined by those who are ‘willing to get into necessary trouble’ to right wrongs. So I expected her to say: ‘I admire your courage and conviction but do not agree that Harvard should divest.’ Instead, she was angry. She called us ‘coercive’ and ‘disruptive’. There was no pride or sympathy in her eyes. When confronted with necessary trouble, Faust despised it. The hypocrisy was overwhelming. Marshall Ganz, a social movement theorist and Harvard professor, defines leadership as ‘accepting the responsibility to create conditions that enable others to achieve shared purpose in the face of uncertainty’. The events of 12 February made it clear to me that Harvard does not understand responsibility in the age of climate crisis, otherwise it would have divested and supported student activists. But on that day I saw leadership in my peers. We are the first generation to live the climate crisis. Despite fear and uncertainty – many Divest Harvard students had never participated in direct action before – we accept that the responsibility to act falls on us. Our work on campus embraced all who wished to see Harvard fight for its students and the world. Despite Harvard’s intransigence, Divest Harvard organized Harvard Heat Week in April 2015. We shut down the president’s office building for six days. Many alumni came back to campus (including Bill McKibben, Darren Aronofsky and Cornel West), and we trained hundreds of students, faculty, staff and community members. Although I have graduated, Divest Harvard continues to grow. 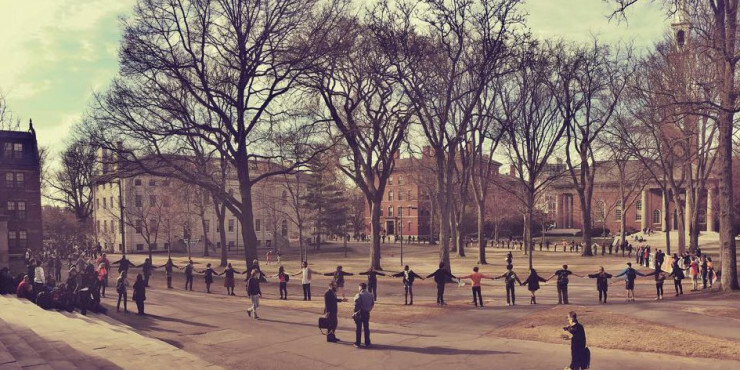 Divest Harvard encircles Harvard Yard during Harvard Heat Week in April 2015. But young climate leaders need support. Philanthropy can provide that support in two ways. First, youth organizers need funding to run their own creative campaigns. We often volunteer our time, and campaigns often lack the resources to become as effective as they might. Second, campaigns like Divest Harvard across the country are breeding a new generation of changemakers with sophisticated organizing skills. But, as I learned when I graduated, there are limited jobs – especially jobs with a good income – for young alumni. How can we create more opportunities in this movement? I imagine a series of fellowships for young climate justice organizers providing support for recent alumni to work on climate campaigns for two years after graduation. In college, we were students and activists. Now we can be full-time activists, but we need the financial stability. Philanthropy can make this movement sustainable for the young people leading it. Rolling Stone journalist Matt Taibbi wrote of youth’s role in the 2016 US elections: ‘Young people aren’t dreaming. They’re thinking. And we should listen to them.’ Today’s youth see through the complexity of the climate crisis to understand what justice looks like. Let’s look through that lens together. Well articulated. Support is really required and indeed with sound funding, sustainable Social Enterprises can be created. Climate change is a reality and we all collectively have a role to play in saving the planet Earth.